Room diffusers are a great way to add fragrance to any space. They are also incredibly easy to make, making them perfect last minute gifts. The sample of the month, Winter Gardenia, brings crisp floral notes along with a hint of peppermint to your space. 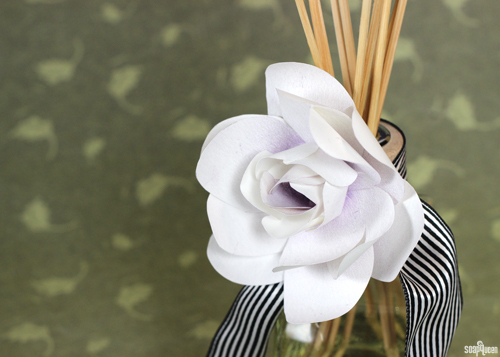 Accented with a beautiful paper gardenia designed by Lia Griffith, this diffuser looks as stylish as it smells. If you’re looking for Winter Gardenia Fragrance Oil blending ideas, check out the Sample Idea Sheet. The sample idea sheets can be found on the right hand side of the Bramble Berry homepage. Along with blending ideas for the current sample, each sample idea sheet also features a tutorial! 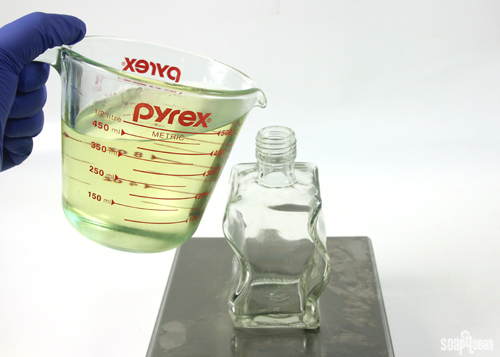 NOTE: The reed bottle shown in this tutorial has been discontinued. 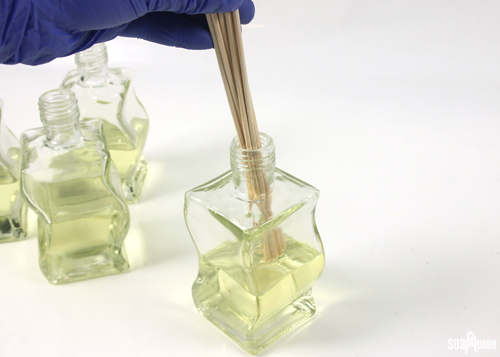 The kit now contains the Nouveau Reed Diffuser Bottle. ONE: In a glass container, combine 6 oz. of Winter Gardenia Fragrance Oil, 8 oz. of DPG, and 2 oz. of Rubbing Alcohol. TWO: Stir the mixture well until it clears, and measure 4 oz. of the mixture into each of the diffuser bottles. THREE: Place a wooden collar over each container. The collar is decorative and will just sit on top of the neck of the bottle, it will not screw in. Remove the raffia tie from a reed bundle, and pinch the reeds together as you insert them into the bottle through the collar. Repeat this for each bottle. FOUR: Gently spread the reeds apart from each other. FIVE: Add a decorative ribbon or paper flower. This paper Gardenia was created using this template by Lia Griffith. 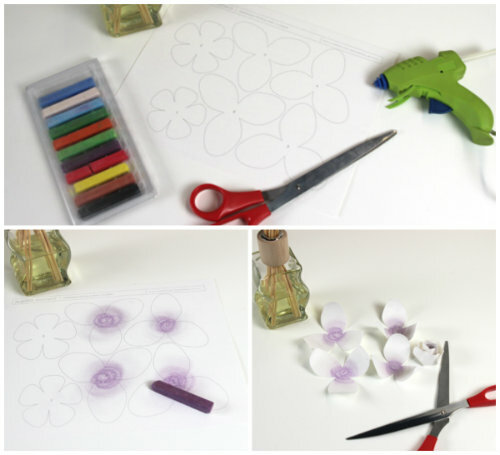 You can find the basic instructions to create the paper gardenia on Lia’s blog, found here. We added a little purple chalk to the center of each paper petal to give the final flower more depth. In a glass container, combine 6 oz. 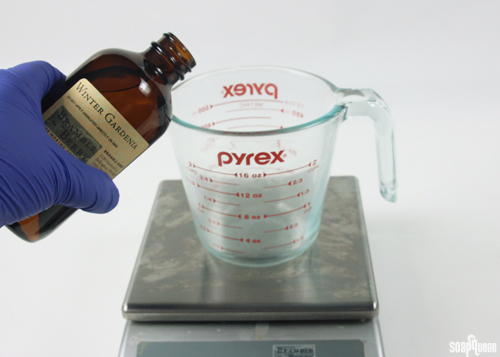 of Winter Gardenia Fragrance Oil, 8 oz. of DPG, and 2 oz. of Rubbing Alcohol. Stir the mixture well until it clears, and measure 4 oz. of the mixture into each of the diffuser bottles. Place a wooden collar over each container. The collar is decorative and will just sit on top of the neck of the bottle, it will not screw in. Remove the raffia tie from a reed bundle, and pinch the reeds together as you insert them into the bottle through the collar. Repeat this for each bottle. Gently spread the reeds apart from each other. Add a decorative ribbon or paper flower. This paper Gardenia was created using this template by Lia Griffith. You can find the basic instructions to create the paper gardenia on Lia’s blog, found here. We added a little purple chalk to the center of each paper petal to give the final flower more depth. 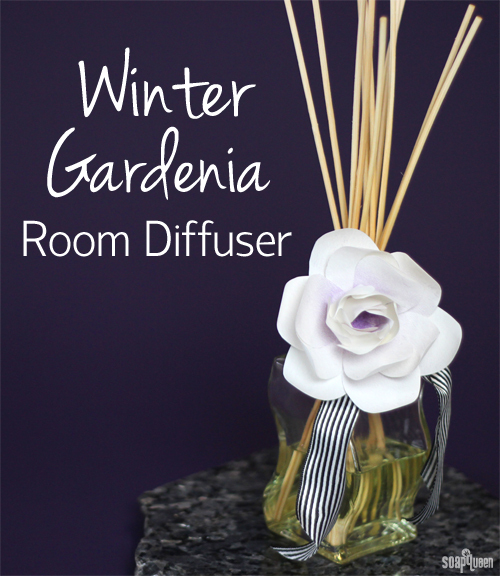 If you received a sample of Winter Gardenia, I would love to hear what you made with it! If you’re looking for more ideas, Winter Gardenia was great in this sugar scrub. I have tried making DIY reed diffusers before and not had much success. I’ve followed a number of online recipes that call for alcohol mixed with sweet almond oil and fragrance or essential oil and the scent in the air, even in a small bathroom, is barely noticeable. 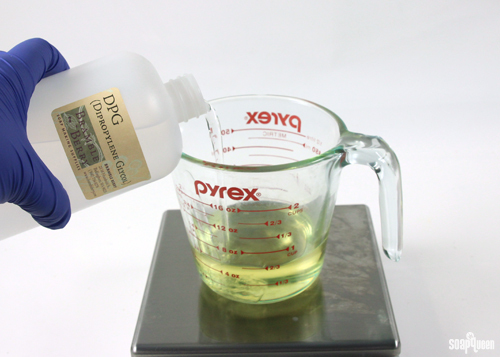 I was wondering, does the DPG really help the scent move up the reeds and dissipate better than a light carrier oil? I’d like to use these as Christmas presents as I have a bunch of reeds and leftover fragrances but am hesitant to try again. Thanks! Hi, I just received this kit in the mail today and I’m not a huge fan of the Winter Gardenia scent (at least not as much as I thought I would be). Any suggestions for fragrance or essential oils that I could blend with the Winter Gardenia fragrance oil to tone down the Strong Winter Gardenia smell? It almost smells too much like perfume. Absolutely, I’d love to help you out! This scent blends well with a lot of our fragrance oils. Adding Vanilla Select Fragrance Oil would give your blend some sweetness. Adding Peppermint Essential Oil, 2nd Distill would bring out the minty notes in the Winter Gardenia. Thanks for the quick response. I happen to have some Peppermint Second Distilled Essential Oil and I believe I may have received the Grapefruit Bellini fragrance oil in the sampler pack I recently ordered. I’ll give those combinations a try to see if they produce a more pleasing yet refreshing scent. what amount would you recommend if using essential oils instead of fragrance oil? It depends on the essential oil! Some essential oils, like Peppermint, are stronger. Peppermint Essential Oil can also irritate your mucous membranes, so using them in a diffuser may cause some irritation. I LOVED this sample when I received it the other day. I made a “smelly jelly” jar out of it! This is so pretty! I would love to see some ideas for packaging this to give as a gift or sell. I’m so glad you like them! If you’re giving them as gifts, you could pour the mixture in and seal the diffuser bottle, and keep the reeds separate. That way your friends and family just need to add the reeds.